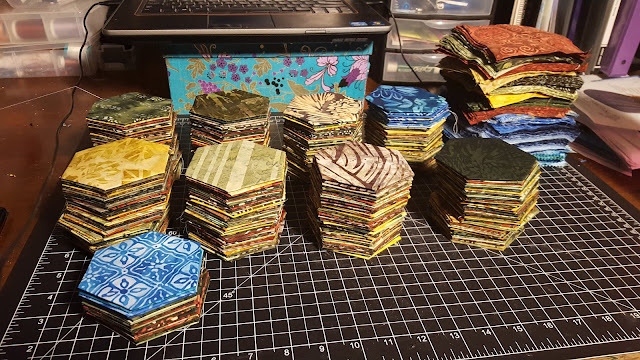 Here is what 415 basted English paper pieced hexagons look like! The stack of cut fabric in the back right is what I have left to baste. I hope to have around 1300 hexes when they are all basted! I started this project back in July and haven't made as much progress on it as I had hoped with the pregnancy and the holidays slowing me down quite a bit, but it is a sizeable stack of hexes nonetheless. I've gotten much faster at making them and can pretty easily baste 12 hexes during a 1 hour t.v. episode. I have also started sewing them together into bigger groups. I hate how uneven the flowers are to arrange, so I've decided to sew them into blocks of 48 in a rectangularish shape. I really need to do more planning, since I still haven't decided how I want to place the land/oceans and how if I want a border and how big exactly is this going to be??? 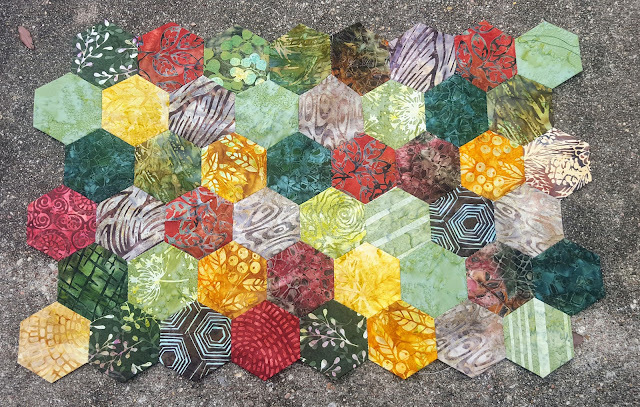 According to CD Designs Website's Hexagon Quilt Calculator, I'll need 1077 hexagons for a queen sized quilt, which is less than my initial estimate and only about 22 blocks of 48 hexes. Hmm. When I printed out a hex grid and numbered it off, it turns out very rectangular, which I'm not a big fan of. I was picturing more of a square...but then I measured my mattress and the top is about 60"x75" which is very rectangular. According to the same calculator, if I were to make it a king sized quilt (108"x108") I would need 1383 hexagons, which is closer to my original estimate. But then it says it would be 35 columns and 41 rows...which is still very rectangular. What am I doing wrong here?Also, if I want to put a border around the outside, should I plan on fewer hexes? Do I have my measurements wrong? Here's my stats. This is a bit of an under-estimate anyway, since I have more flowers sewn together that I'm not counting, and I didn't include the sewn hexes in my basted hex count.